The Nike Air VaporMax Flyknit 3 features flowing, 2-tone lines of breathable, stretchable Flyknit construction for unique, street-ready style. Revolutionary VaporMax Air technology keeps spring in your step with toe-to-heel cushioning. Flyknit construction seamlessly integrates breathability, stretch and support. Textured 2-tone upper takes inspiration from the flowing, linear lines of couture fashion. Strategic engineering creates contoured cushioning that sits directly underfoot and flexes with your stride. 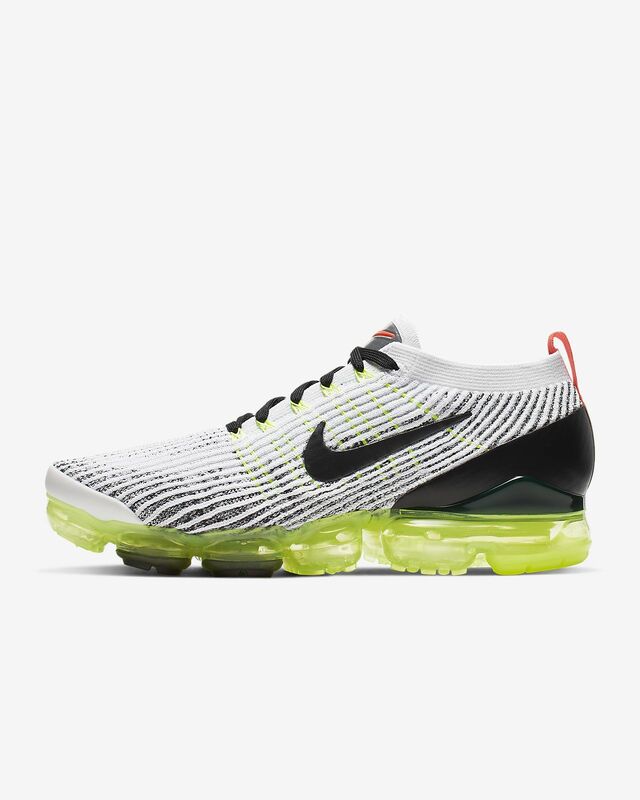 Skin overlay on heel center features a linear "VAPORMAX" logo. Tongue label draws inspiration from patches on Apollo space suits. Integrated lugs across the outsole create bouncy traction. Rubber pods in high-wear areas enhance durability. I've been wearing Vapormax since 2017. They are a really comfortable shoe. I recently bought a 2019 version and the shoe has evolved. It feels more supportive and the comfort factor is still there to make it feel like you are wearing socks. I've been a fan of the Nike VaporMax sneakers. It's just something different than the same old Jordans, Ultraboost, and any other sneaker that everyone wears. The flyknit is definitely more sturdier, and feels great on feet.